'My sister inculcated South Indian culture and values in her,' Dr Sarala Gopalan, US Senator-elect Kamala Harris' aunt, tells Rediff.com's Shobha Warrier in Chennai. 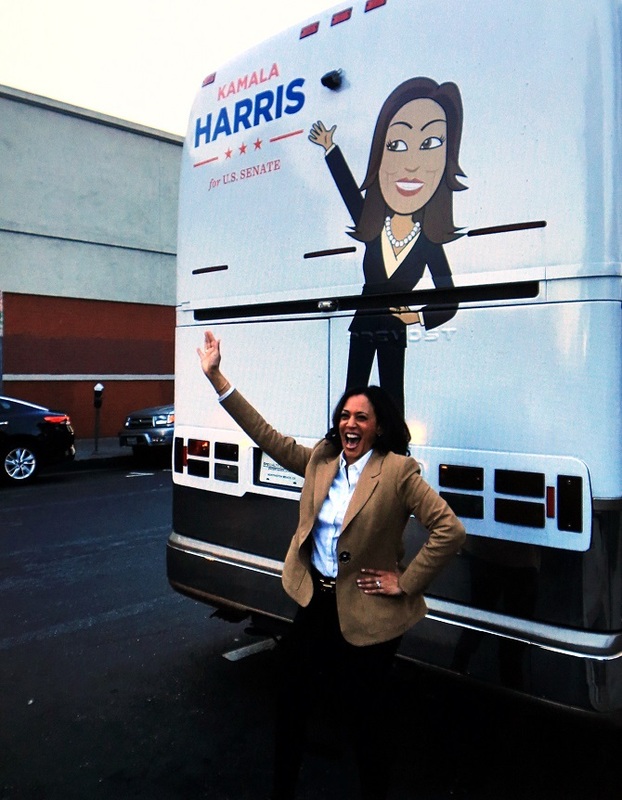 IMAGE: Kamala Harris on the campaign trail. Six years ago after Kamala Harris was elected California's attorney general I met her Chithi (mother's younger sister), Dr Sarala Gopalan in Chennai. Six years later, when I meet Dr Gopalan -- a consultant at the Voluntary Health Services -- she is even more proud that her niece has just been elected a United States Senator, the first Indian-American Senator in the community's history. So Dr Gopalan broke coconuts at the Pillayar Ganesha temple where her mother Dr Shyamala Gopalan had once been a committee member when it was first set up. So I asked Dr Gopalan whether she had broken coconuts this time too. "Yes," she said, "I did break 108 coconuts, but without her asking me to do so. She didn't even know that I did. As attorney general, she did very well and coped up with the work. She fought to get many things done for the state of California and that is why she won (the US Senate race) by such a huge margin." "It is not that we had long chats about what she was doing all these days," Dr Gopalan added. "It was not possible as she had a very busy schedule, but we updated ourselves and knew how she was doing." 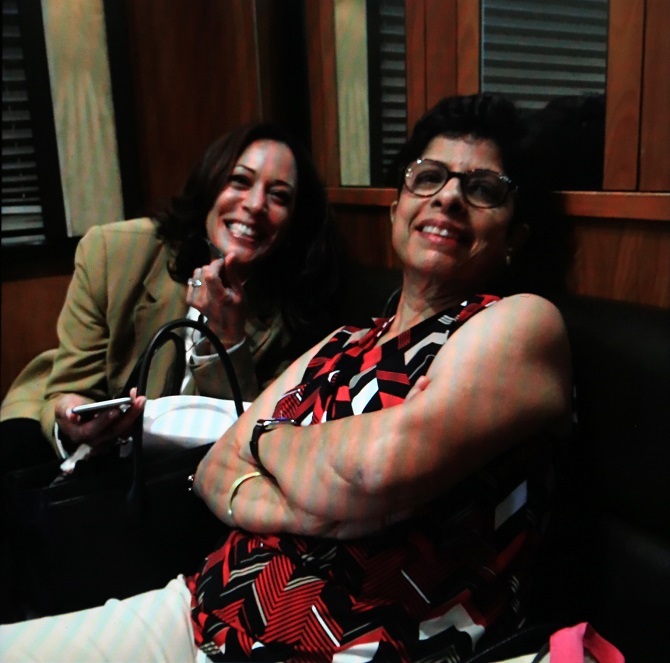 IMAGE: Kamala Harris, left, with her youngest aunt Mahalakshmi. "This time, my younger sister Mahalakshmi flew from Canada to be with Kamala. She has been staying with her to help her during the campaign as her mother, my elder sister, is no more." "As my brother and myself are in India and quite far away, it was easier for my younger sister to be with Kamala," Dr Gopalan added. "Kamala's younger sister Maya was one of Hillary Clinton's political advisors," Dr Gopalan pointed out. "Maya was with Hillary throughout her campaign, hence she could not be with Kamala at all. That was one reason why my sister decided to be by Kamala's side. Both my nieces were extremely busy during the elections." "Mahalakshmi was with Kamala throughout the campaign, travelling with her, attending her rallies," Dr Gopalan said. "On Election Day, she was with Kamala and sent me a message at 9 45 in the morning or so when the counting was over, that Kamala had won." "Before going to bed, Kamala spoke to me. 'Chithi...' she said, and before she could say anything more, I congratulated her on her victory. We didn't have a long conversation, she was exhausted." "I didn't miss all the action as my sister kept telling me every minute detail about the programmes, sending me pictures of the rallies, both of them standing by the election bus, etc," Dr Gopalan said. "After she decided to run for the Senate and before she filed the nomination, she called all of us, her aunts and uncle, and told us of her decision. We hoped for the best as we wanted the best for her. She really wanted to achieve this." "It is funny that some newspapers like The Los Angeles Times described her as the first black woman to enter the Senate while some describe her as an Indian American. Let them write whatever they want. Whether black or brown, she is a caring, soft-hearted person who can't see anyone suffer." "Even though she was born and brought up in America, my sister has inculcated in her South Indian culture and values. She believes in going to the temple because her mother believed in it. Kamala is what she is today because of her mother. The credit doesn't go to any other person. It is my sister, her mother, who brought her up like this," Dr Gopalan said. "My sister (Dr Shyamala Gopalan) was a very strong woman, very hardworking, very intelligent. After doing her graduation in home science in Delhi, she went to America for higher studies with a scholarship in 1957-58. She went on to do her Masters and get a PhD. She went on to become a scientist who worked on breast cancer. 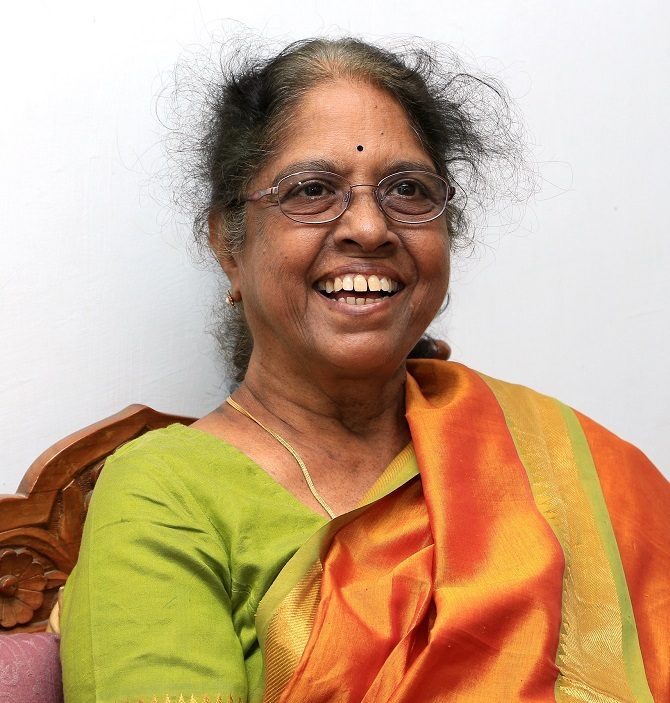 She had done a lot of research on cancer and was quite well known in that field," Dr Gopalan recalled. "She met Dr Donald Harris, a Jamaican American and married him in 1963. Kamala was born in 1964, the first grandchild in the family. My sister was a true South Indian in all aspects and loved South Indian food," Dr Gopalan remembered. "Whenever we went there, she insisted on cooking South Indian food and feeding us that." "That is why her daughters also like South Indian food. When they come here they eat only our south Indian food. My younger sister, the best cook in the family, was cooking South Indian food for Kamala and her husband when she was there now." "Both the girls, Kamala and Maya, loved and respected their mother a lot and she had a great influence on both of them. That is why Maya's granddaughter is named after my sister Amala Shyamala! Yes, I am a great grandaunt now!" "Though Maya was with me for two weeks last year, Kamala hasn't had the time to come to India recently. I met her at her wedding two years ago. All of us from the family were there to celebrate the day. As she got married a Jewish American who is also a lawyer, there was a Jewish ceremony as well as an Indian ceremony with mangalsutra etc." "The wedding was a family affair with our family, his family and very close friends attending it. There was vegetarian food for us at the feast as she knew we eat only vegetarian food." 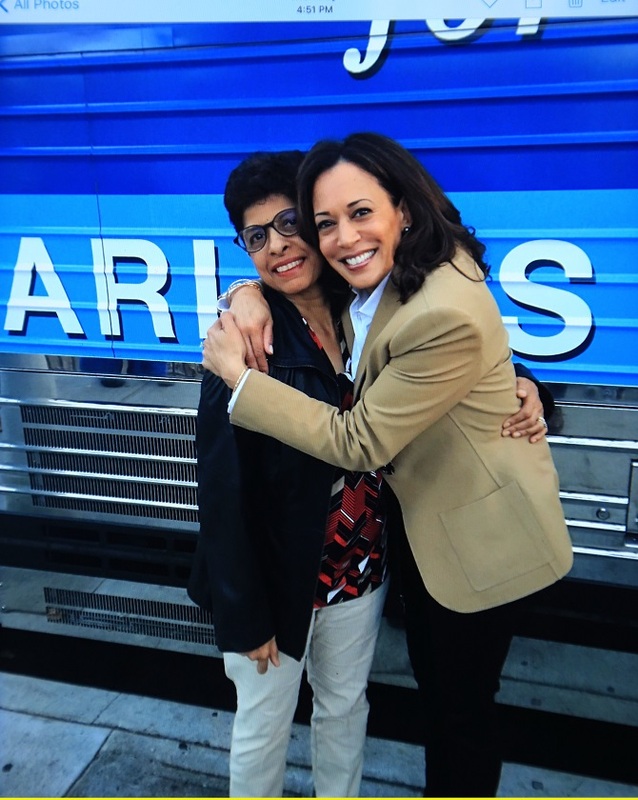 IMAGE: Kamala Harris, right, with her youngest aunt Mahalakshmi. "Though she missed her mother, both of us Chithis were there. The labels on the table were Sarala Chithi, Subhash Chithappa, etc." "All of us are planning to attend her swearing-in ceremony. My brother had already planned a trip to visit his daughter. My plan is to go, be with her if everything falls in place." "Kamala is an ambitious girl; she knew what she wanted to achieve. She wanted to be a lawyer, she did. She wanted to be attorney general, she did. She wanted to run for the Senate and she did." "When I was there, there was an article in one newspaper listing six women who could be President one day. Kamala was on the list." "Having known her fighting spirit, I don't think she will stop here. She is not scared of anything and will fight for everything that she aims to achieve." The American who rescues Indian treasures!